Common Groundsel is a herb 10-40 cm tall. Bright florets are mostly hidden by the characteristic bract giving it the appearance of never opening flowers and with a life span of 5-6 weeks. Common Groundsel lives humbly among and occasionally under the other weeds and is easy not to notice. Leaves are stalkless, lower ones eared, and stem-clasping above. Leaves are pinnately lobed and 2.4 inches long and 1 inch wide and get smaller above. Leaves are covered sparsely with soft, smooth, fine hairs. The hollow succulent stems branch at the tops and from the base. Flowers are borne in open clusters of 8-10 small cylinder shaped rayless yellow flower heads 6-13 mm with a prominent ring of black tipped bracts at the base of the inflorescence as is characteristic of many members of the genus Senecio. 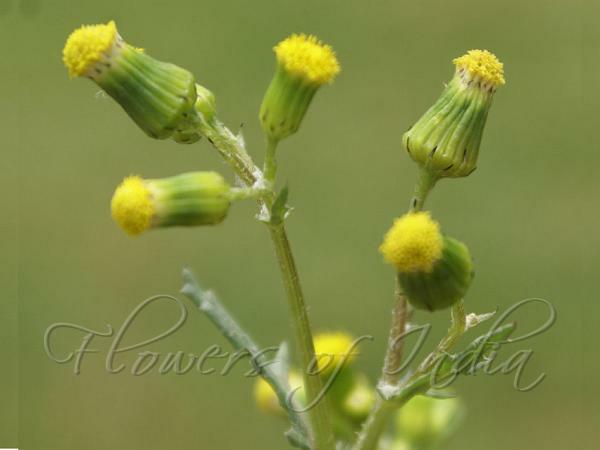 Common Groundsel is native to Europe, Russia and China, naturalized in Kashmir valley.